Guikas GTC - GTC is an important car dealer located in French Riviera with the most impressive classic cars collection. GTC is an important car dealer located in French Riviera with the most impressive classic cars collection. 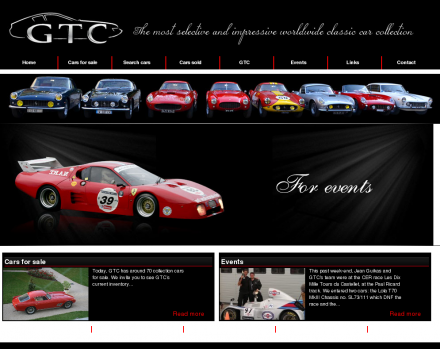 Guikas GTC provide you authentic race cars, classic cars and antique cars for sale. Rare authentic classic cars for classic cars collectors. Description: Guikas GTC provide you authentic race cars, classic cars and antique cars for sale. Rare authentic classic cars for classic cars collectors. Leatherwear UK (Popularity: ): Offering a variety of coats for men and women. International delivery offered. India Showroom (Popularity: ): Available are salwaar kameez, sarees, lachaas and gift items.